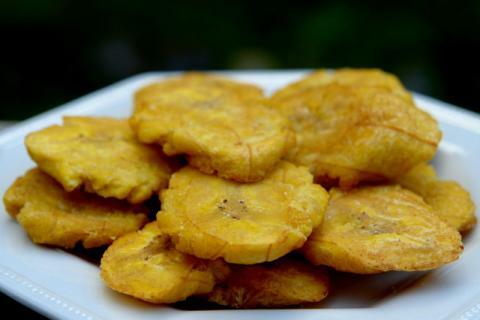 Slice the plantains into rounds 1/4-thick, and sprinkle lemon juice over the pieces, stirring to moisten. In a separate bowl, combine the ginger and pepper. Heat about 1/4 inch of oil in a heavy skillet until a test piece of plantain sputters. Roll plantain pieces a few few at a time in the spice mixture to coat surfaces, then transfer to the skillet. Fry until outsides are crisp and golden. With a slotted spoon, remove plantain to an absorbent cloth for cooling. Serve hot.